Winter weddings have a magical atmosphere you can’t experience the rest of the year. There’s twinkling lights, holiday trees and if you’re lucky – some snow! To make your winter wedding even more spectacular we’ve rounded up some tips and suggestions to reference when choosing your theme that will make your wedding even more magical. If you want a classic winter wedding, incorporating blacks, reds, and gold into your wedding’s theme will create an atmosphere of elegance and class. You can pair black suits or tuxedos with deep red bridesmaid dresses and gold jewelry and shoes. You may even want to get a pair of gold shoes for yourself! When it comes to flowers, you can choose from deep red roses, with gold sprigs, or tree branches. You can also go with classic white flowers like roses, hydrangeas or lilies. A soft pink wedding can be achieved by incorporating various shades of pink into your theme. Mix and match with soft dusty roses, deep, rich plums and some golds or creams as an accent color. Purple and cream roses, freesia, calla lilies, aster and hyacinths are all great floral selections. If you prefer a more earthy, rustic feel to your wedding then try incorporating colors like brown, taupe and earthy reds, or for something different, an ice blue. With these colors, you can add natural wood into your decor like tree branches, wood slabs as a base for your cake or centerpieces and use lots of greenery in your flowers. This may seem like an unusual color scheme for a winter wedding, but pairing mustard yellow and gray together will create a soft feel. These color pairs nicely to make for those who want to create a garden-like ambiance in the middle of the winter. When it comes to flowers, lots of greenery with cream and pale yellow flowers will look stunning against light gray bridesmaid dresses. This is another less traditional color combination, but one that will really create a “wow” factor. Deep plum or emerald bridesmaid dresses accented with golds or creams will really pop against a white winter landscape. Depending on what color you choose for your dresses, you can accent with the color on your place settings using colored menus or linens. If reds, burgundies, and golds aren’t your thing, you can opt to use different shades of blue for your winter wedding. Mixing deep navy with lighter shades of blues will create a magical atmosphere for both you and your guests. 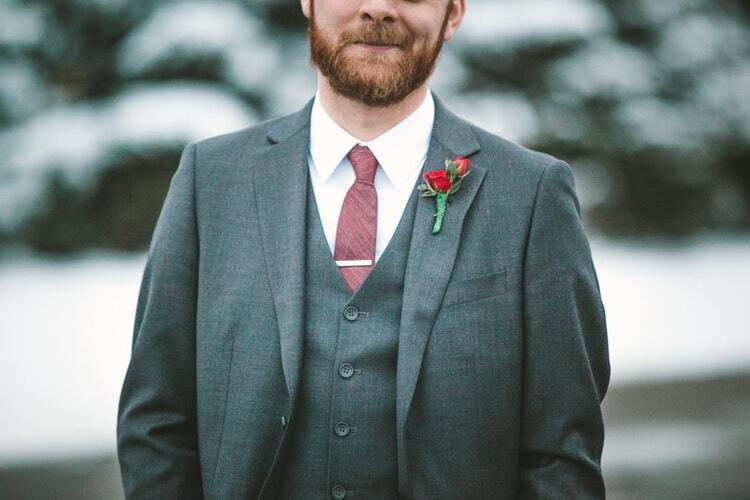 The men can wear light gray suits, the bridesmaids can wear your favorite shade of blue and for flowers, you can use greens like eucalyptus, cream roses, and cotton leaf branches. Though a Black Tie wedding isn’t reserved solely for the winter time, there is a classic feel to having this theme for your winter wedding. 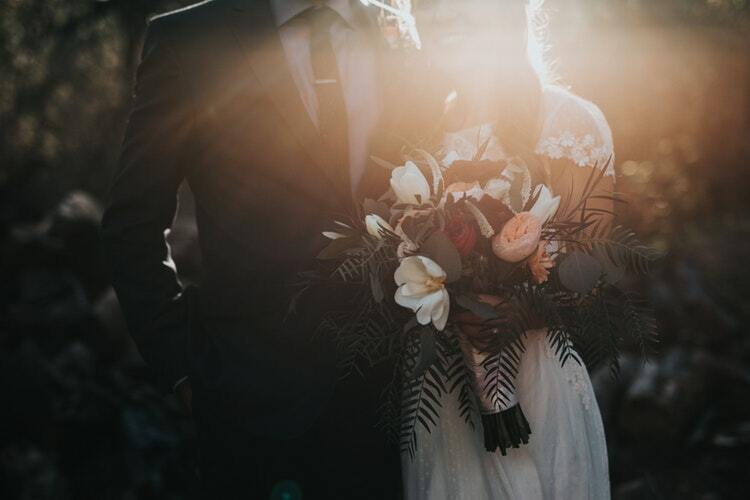 Black bridesmaid dresses, black tuxedos paired with soft taupes and creams for your flowers will turn your wedding into an upscale, elegant affair. 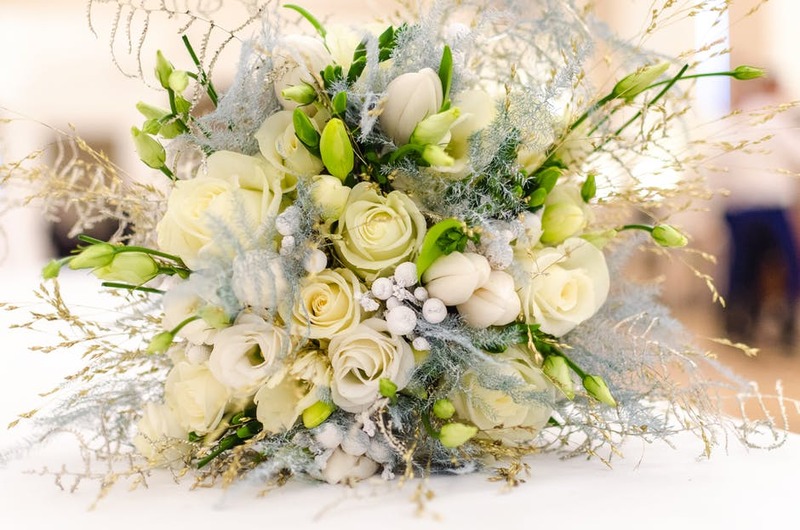 Whatever theme you choose, there are so many options when it comes to a winter wedding. 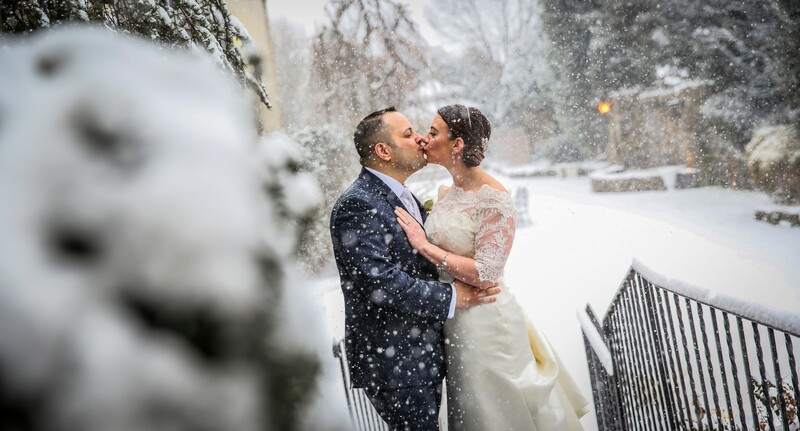 If you’re lucky enough to get snow on your special day, don’t forget to brave the cold weather so your photographer can capture some breathtaking photos that you will treasure for a lifetime.